5. Which sadhana should be performed ? Today, we have assembled with the intention of uniting Hindus for the protection of Dharma. Let us start the topic with describing the prevailing state of the Hindu Dharma. Swami Vivekanand spoke about the Hindu Dharma with great pride. Using various references from the Vedas and Upanishads He explained the importance of the Hindu Dharma to the westerners. How many preachers of Hindu Dharma can speak with pride about Hindu Dharma with in-depth study ? How many Hindus can speak on the Holy texts Ramayan and Mahabharat in front an audience for even 5-10 minutes ? How many people pray, chant, recite mantras, meditate and concentrate as sadhana (Spiritual practice) ? Answers to these questions are not at all encouraging. Bharat is looked upon as the spiritual Guru of the world. We have the highest level of knowledge which no other religion has, written in the form of the Vedas, Upanishads, Mahabharat, Ramayan etc. by our Sages. Yet, it is indeed very unfortunate that we have to advise Hindus to have pride in their Dharma. The main cause of downfall of the Hindus is their ignorance about their Dharma. Hindus do not know their religious duties. Hindus should be made aware of their religious duties, meaning, encourage them to perform sadhana. Making the society aware of its religious duties and protecting Dharma was earlier the duty of the king; however, at present we ourselves will have to take the responsibility of protecting Dharma, which is as herculean a task as lifting Deity Shiva’s bow. Here, I have particularly referred the task as ‘lifting Shiva’s bow’ because, we all are aware that mere strength does not help budge the bow even by a whisker. It was only when the strength was backed by Divine Energy, that it could be lifted. Likewise, protecting Dharma are not merely physical, psychological or intellectual level efforts; they need to be backed by efforts at the spiritual level as well. Simply said, to protect Dharma along with Kshatratej (Radiance of a warrior), Brahmatej (Radiance of a Bramhan) is also required. Today, we will try to understand the meaning of Brahmatej, the place it occupies in the annals of history of Hindus and its necessity in uniting Hindus. 2A. What is Brahmatej ? Whenever a task is going on, its success is decided by factors active in that task. A Nuclear bomb is more powerful than an atom bomb, because it is subtler than the atom bomb. Which means that the subtle is superior to the gross. We will try to understand this aspect. Perceiving the whereabouts of the enemy with the five senses, for instance, sensing the enemy or his movements, one can shoot him down with a gun. However, if he hides behind something and is motionless, then the gunman will not be able to shoot at him and therefore cannot kill him. Here, only a physical weapon is employed to kill. In the ancient times, arrows were shot from a bow only after chanting a mantra. Due to the mantra, the name of the enemy would get etched on the arrow, and no matter where the enemy hid in the three regions of the universe, the arrow would certainly kill him. In the next step, an enemy can be vanquished without using physical weapons like guns, bows and arrows etc., merely by the use of a specific mantra. 2A 4A. How does a resolve function ? A minimum spiritual level of 70% is essential for accomplishing a task through resolve. Given ahead is an example about how a resolve functions. Let us say that the power of the mind of a human being is 100 units. Many thoughts arise in the mind of everyone throughout the day. A certain amount of energy is spent in these thoughts. If a person gets a hundred such thoughts in a day, he will lose most of his power. However, if there are no thoughts in his mind, that is, if the mind is thoughtless, then a single thought that ‘may so and so occur’ will have the power of 100 units behind it, which will make that thought come true. This is what is known as ‘Brahmatej (Radiance of Brahman)’. If that thought is about Sat (Absolute Truth or God Principle), then his own sadhana (Spiritual practice) will not be wasted. God Himself will complete the task since it is of Sat, that is, His own. Of course, for achieving this, a seeker has to attain such a state of mind through the components of sadhana such as chanting, satsang (Holy company), satseva (Service unto Absolute Truth), sacrifice for Sat, so that no thoughts of asat (Untruth) will arise in his mind. Now, some may wonder if things really occur with a resolve. When the universe itself was created by the resolve of God, can there be anything more powerful than a resolve ? We hear about stories from the Pouranic era where Sages cursed someone. A curse is very much a resolve, meaning, it is a wish that becomes fruitful depending on the strength of sadhana of the Sage (who curses). Never bank on mere physical level efforts for protection of Dharma and establishing the Hindu Rashtra; rather perform sadhana and with the resolve strength so generated perform the necessary task. 1. Lakhs of people willingly and faithfully attend programmes of Saints. They need no bribe or transport facility – things that are part and parcel of political meetings today. People are present at the venue for Yogarushi Ramdevbaba’s programmes as early as 5 a.m.
2. No political party spreads its message overseas; however, spiritual organisations do spread their messages overseas too; this is because these organisations possess spiritual radiance, meaning Brahmatej. Devotion unto Dharma which is devoid of ego can be generated through sadhana only. Revolutionaries did not have ego. Hence, they could sacrifice their lives as well. Hindus history has many examples of Avatars (Incarnations) and great Saints who used their Kshatratej and Brahmatej to protect Dharma. He has been described as follows. Meaning : He has the four Vedas in His mouth (Absolute Knowledge of Vedas) and a bow and arrows on His back (has valour). Here, Brahmatej and Kshatratej co-exist. Whoever opposed Him was defeated by Parashuram, either with a curse or an arrow. With these two possessions, Bhagawan Parashuram circumambulated the earth 21 times and destroyed all Kshatriyas. Sage Valmiki has referred to this act as ‘Rajvimardan’, which means elimination of evil rulers. The noteworthy point here is that Bhagawan Parashuram destroyed His opponents not merely with weapons but with a curse too. Our Guru H.H. Bhaktaraj Maharaj once said, “Arjun was undoubtedly an excellent archer, but he was an ardent devotee of Shrikrushna as well. When releasing an arrow from his bow, he always chanted the Name of Shrikrushna. As a result, his arrow never missed the target. By chanting the Name of Shrikrushna, the resolve in the mind of Arjun of striking the target was fulfilled”. He was a great devotee of his Kuladevata (Family Deity) Shri Bhavanidevi. He would always chant ‘Jagadamba, Jagadamba’. The war cry of his army too was ‘Har Har Mahadev’. Hence, despite lack of manpower and equipment, he was able to defeat 5 strong dynasties and lay the foundation of ‘Hindavi Swarajya’. It is only because of his sadhana that Saint Tukaram Maharaj and Samartha Ramdas Swami blessed him and he was protected from many dangers. Chanting and devotion bestow Divine strength and we attain success in the task we have undertaken. These are examples to prove this point. 1. Let us try to understand this through a shloka (Holy verse) by the Guru of the Nation, Samartha Ramdas Swami. All of us strive to protect Dharma. When fighting to protect Dharma, you must have had life-threatening experiences. If you are a devotee of God, then you will come out of even the gravest of calamities unscathed. Recollect the following incidents from history. You will realise the truth in this shloka. 2. Eighty percent people in the society are affected by negative energies. We are performing the Divine mission of Hindutva. Invisible negative energies oppose this task. Hence, distress such as heaviness of the eyes, blocking of thoughts, obstacles in the mission and consequent depression can be experienced. To overcome this distress and to allow smooth functioning of the mission, performing sadhana is the only remedy. 3. Main obstacle in uniting Hindus is the ego of proactive Hindus. Sadhana reduces ego, enhances humility and helps in building rapport with others. In short, sadhana enhances Divine virtues in an individual. Volunteers of Hindu Janajagruti Samiti (HJS) and seekers of Sanatan Sanstha perform sadhana every day, and hence, they are able to mingle with others at once. 1. Physical level : One lion has the potential to tear apart hundreds of jackals. 2. Intellectual level : A scholar can defeat thousands of poorly educated people in a debate. 3. Spiritual level : There are thousands of stories on how Sages have singlehandedly made people in authority and kings bow in humility. Similarly, Deities and Incarnations have singlehandedly defeated powerful enemies who had huge armies. The spiritual level of an ordinary individual is 20%. Such an individual is unable to do anything for establishing the Hindu Rashtra, because He cannot think beyond himself and certainly not about the Nation and Dharma. Hindus who do not understand the meaning of blessings and spiritual prowess obtained from sadhana can be termed as only ‘Hindus by birth’. They are unable to perform any task for the Nation and Dharma. In this Convention, we will discuss about protecting Dharma. Later, going to their respective regions, based on the discussions today, participants will also implement the decisions taken today. However, along with that, it will be necessary to commence sadhana. If any of you here are performing sadhana, then you must have already experienced this aspect. Such people should tell others the importance of performing sadhana. 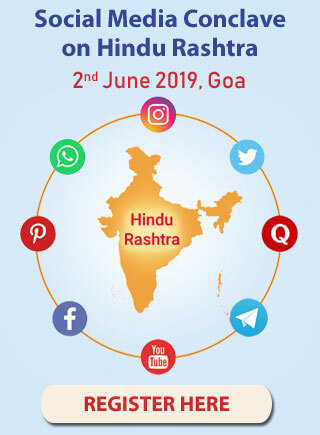 Since seekers of Sanatan Sanstha and volunteers of HJS perform sadhana and have studied religious scriptures, various television channels invite these seekers and volunteers as representatives of Hindusthan for their official opinion on Hindu Dharma. So far, various topics for which seekers and volunteers have been invited are – how to celebrate Ganesh Chaturthi, religious information on eclipse, spiritual perspective on ‘live in relationships’, spiritual perspective on ‘gender change’. In 2010, while speaking on the topic of ‘Increasing population of Muslims’ a Swami said, ‘Hindus too should have many wives and should give birth to many children. Only then will the Hindu population grow and so will their ability to fight the Muslims’. Since such thoughts are against national interests and religious principles, people got a erroneous message at the psychological level. Also, Hindus did not get the right perspective that they need to have Dharmashikshan and abide by Dharma. Now, many of you must be wondering which sadhana should be performed. Some of you must be performing puja (Ritualistic worship), reciting stotras (Verses in praise of God), keeping religious fasts etc. Continue with what you are doing. In addition, chant the Name of God continuously. Chanting is sadhana of Upasanakanda (Stage of worship with the mind). It is not restricted by time and place, and can be performed anytime, while moving around, while performing daily chores. With chanting mentally, you can remain close to God. If you are already chanting the Name of a Deity or that given by a Guru, then make efforts to chant it continuously. If you are going to start chanting for the first time, then chant the Name of the Kuladevi (for example, ‘Shri Durgadevyai Namaha’) as much as is possible. If you do not know the Name of the Kuladevi, then chant the Name of the Kuladev (Male Family Deity), and if both are not known, chant ‘Shri Kuladevatayai Namaha’. To prevent or overcome problems caused due to deceased ancestors or if there is mild distress of this nature, chant ‘Shri Gurudev Datta’ for 1-2 hours every day, in case of moderate distress chant for 2-4 hours and in case of severe distress chant for 4-6 hours. If you who wish to know more about sadhana, you can obtain the required information in detail from the ‘Sadhana section’ behind this hall. Speakers of Sanatan Sanstha and Hindu Janajagruti Samiti always begin their speech by offering salutations to H.H. Dr. Athavale and Bhagawan Shrikrushna. They conclude their speech in the same way. Hence, this prevents inflation of their ego. If ego is low, it will help in obtaining the blessings of God, and God blesses when we remember Him. You too can experience what you feel by starting and ending your speech by remembering the Name of your Ishtadevata. Pray unto your Upasyadevata (Deity of worship) for success of any campaign or agitation by any other organisation held to protect the Nation and Dharma. 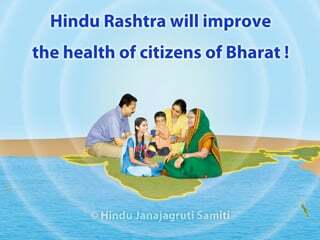 At the same time, pray every day for establishing the Hindu Rashtra. Seekers and Saints of Sanatan Sanstha and volunteers of HJS pray and chant during an agitation of Yogarushi Ramdevbaba and Anna Hazare or anyone else, that is being staged in the interest of the Nation and Dharma. Even otherwise, they pray and chant for the success of the agitations being staged by these two organisations as also for establishing the Hindu Rashtra. They have been praying and chanting for the success of this Convention for the past three months. After the conclusion of this Convention on 14th June, let us pray for this every day ! Along with sadhana, it is important to abide by Dharma and Achardharma (Code of conduct); because, Hindu Dharma has propounded not just different paths of worship, Holy and religious festivals, conduct and thought, diet and leisure to enhance the Sattva component, but every act in day-to-day life is directed at achieving that, effectively meaning sadhana to take place. This is the unique feature of Hindu Dharma. Abiding by Hindu Dharma takes us closer to God. Day-to-day religious actions like puja, Arati, celebration of seasonal festivals should be performed after understanding the underlying science. Following family customs and traditions itself is called ‘Dharmacharan’. These are some regular acts that can be called Dharmacharan. If they are performed not merely as acts but considered as abiding by Dharma, after understanding the underlying science, they will give greater spiritual benefit. Dharmacharan should be looked upon as a duty unto the mission of protecting Dharma. According to our Dharma, we should abide by Dharma ourselves and propagate it among volunteers, Hindu society etc. If after beginning to chant you get some exceptional spiritual experiences, do write them down and send them to us. To inform the society of the importance of sadhana, we will publish these experiences in our periodicals and websites. Through the discussion so far, we have understood the importance of Brahmatej in the history of Hindus, importance for Hindus to perform sadhana so as to generate Brahmatej in themselves and which sadhana to perform. Let us now make a comparative study of the politicians, Hindu workers and workers committed to Dharma. The main objective of all Hindus is establishment of the Hindu Rashtra. 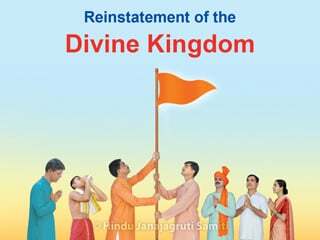 Establishing the Hindu Rashtra means restructuring the Nation ! Restructuring the Nation is a scientific process and only Truth has a role to play in it. Let us now see who can perform this task. 7A. Why are the present day politicians unfit to establish the Hindu Rashtra ? A typical present day politician is untruth personified. Corruption, selfishness, immorality, adultery and other such defects exist in politicians and party workers. Hence, ‘restructuring the Nation’ through these politicians is next to impossible. All that politicians are interested in is seeking unlimited power. As against this, for restructuring a Nation virtues such as selflessness, no desire for fame, sacrifice are necessary, and only a seeker with devotion unto God and performing the mission of protecting Dharma has these virtues. Hence, only righteous Hindu volunteers can establish the Hindu Rashtra. 7B. Are all Hindu volunteers competent to establish the Hindu Rashtra ? We are performing the task of protecting Dharma by uniting various people in the society. Though individuals united for the purpose of protecting Dharma have a Hindu line of thinking, their temperament and thought process varies. I am sure you too must have experienced this. Some Hindu volunteers have vices, addictions etc. In short, volunteers function in a Hindu organisation just as they do in various political parties. By taking them along, we can increase numerical strength; but we will not be able to protect Dharma. For that matter, in the establishment of the Hindu Rashtra, Hindu volunteers will not be competent enough. Virtues seen in righteous Hindus are absent in Hindu volunteers or politicians. In this mission of establishing the Hindu Rashtra, to take control of the situation there is a need for an expansive analytical intellect; only a sattvik intellect is like this and only the intellect of an individual making efforts to realise God is sattvik. To understand the further course of action in life, there is a need for a mind with inner knowledge and for a visionary who can see the future. This foresight is seen only in righteous volunteers. Forget the vision of the future, learning from our past experiences, Bharat’s Prime Ministers so far have not understood the behaviour of Pakistan. H.H. Kane Maharaj, a great Saint from Narayangaon, has very accurately pointed out the importance of righteous Hindus in the establishment of a Hindu Rashtra. He says, ‘God does not take an Avatar when a Nation is in crisis or under foreign rule, but He does when devotees are intimidated. Hence, when we increase our devotion, we will receive support from God and our dream of a Divine Kingdom will materialise’. Whenever Avatars and great Saints in Hindu Dharma have had to fight adharma in their lives, there are examples to show how they united devotees of God. To attack Lanka, Bhagawan Shriram got the army of monkeys (all were His devotees) together. Chhatrapati Shivaji Maharaj needed an army to fight the Mughals. On the guidance of Samartha Ramdas Swami, many of His devotees joined the army of Chhatrapati Shivaji Maharaj. Since Chhatrapati Shivaji Maharaj’s army was devoted unto God, along with the mavalas, it took the oath of ‘Hindavi Swarajya’ in the presence of the Deity Shri Rohideshwar. 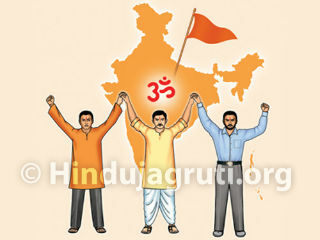 In Bharat, many organisations are devoted to the cause of serving Hindu Dharma. Some organisations had great ideas of doing something for Hindu Dharma; however, they have not been able to do much. Despite these organisations having performed tremendous service over the past few decades, why has this situation arisen ? This is because they rendered all the service at the psychological level. Since it was not supported by sadhana, they neither received Brahmatej nor blessings of God. We cannot afford to let this happen. God does not help the devotee of the Nation, but helps His devotee. Taking this fact into consideration, we have to enhance our sadhana, so that our mission will be blessed by God. In all the above incidents, hundreds of seekers of Sanatan Sanstha had to face various problems, but because of their strength from sadhana, they were able to remain steady. This too will explain the importance of the prowess obtained from sadhana. Sadhana awakens the energy of the soul, which in turn helps the individual in performing the mission of Dharma very effectively. Hence, encourage volunteers of your organisation to perform sadhana. To achieve this, you can make the following efforts in your organisation. A. Advise the volunteers of your organisation to perform sadhana of chanting God’s Name. B. During the meetings of the organisation, just as you review the campaigns launched, devote some time to review sadhana by asking the volunteers what efforts they have made as sadhana in the previous week. C. Organise workshops to impart Dharmashikshan to the volunteers of your organisation. Give them Holy texts and CD’s that impart Dharmashikshan. If the Hindu volunteers are educated on Dharma, besides comprehending the greatness of Hindu Dharma they will also learn how to refute the atheists, heretics and preachers of other religions at the intellectual level. D. Make volunteers aware of defects which are harmful for the process of uniting Hindus and help them overcome them. Life of an individual who performs sadhana gradually becomes value-based and chaste. Hence, if volunteers commence sadhana, then gradually vices, ego and defects like arrogance in them will start decreasing. Besides, they will also begin to progress spiritually. If volunteers perform sadhana, then there will be a qualitative improvement in the mission of the organisation and positive changes in the attitude of volunteers. Do let us know if you make any efforts at the organisational level in this direction and get encouraging results. They will help encourage other Hindu organisations towards similar efforts. We will keep everyone informed about such efforts. So far, we have discussed the importance of Hindu leaders and volunteers performing sadhana. Like the politicians, we cannot be selfish in thinking about ourselves and our organisation. Our efforts are directed towards emancipation of the society. Hence, we should also make efforts to inform the society about sadhana that can erase the demerits of many births. 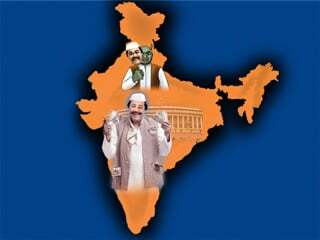 Our goal is to rebuild an ideal Nation, meaning, the Hindu Rashtra on the soil of Bharat. When we talk of an ideal Nation, we think of Ramrajya. Shriram as the king was worthy of envy. Why did the subjects in that era get an ideal king like Shriram ? The most important reason is that subjects abided by Dharma and hence, they were blessed with a sattvik king like Shriram and were able to live in the ideal Ramrajya. We too can establish a Ramrajya now, that is, the Hindu Rashtra ! However, for that to become a reality, the Hindu society has to abide by Dharma and be devoted to God. In the earlier times, majority of people performed sadhana and hence, most people were sattvik. In Kaliyug, however, since majority of people do not perform sadhana, the proportion of Raja-Tama components has grown tremendously. As a result, the state of the Nation and Dharma has deteriorated. To change this situation, everyone has to perform vyashti and samashti sadhana. Vyashti sadhana will enhance sattvikta in the individual. If the Hindu society has to abide by Dharma, then it is important to understand the present state of the Hindu Dharma. People of other religions have religious leaders in their places of worship to impart them with Dharmashikshan; for example, Christian priests in the churches and maulavis in mosques. As a result, Christians know at least a little of the ‘Bible’ and the Muslims a little of the ‘Quran’. As against this, how much of Shrimadbhagwadgita do Hindus know ? Even those who read Shrimadbhagwadgita simply as a text are rare to find. Those who are able to comprehend what they read are even more rare, and those who practice what they understand are one in a billion. This is the present state of our Hindu Dharma ! There is absolutely no relationship between professional education and ignorance in Spirituality. In every group, from the illiterate, primary educated, secondary level, graduate or post-graduate, approximately 80% people are ignorant about Spirituality since they have received no education on it. At present, there is no system in place for imparting Dharmashikshan to Hindus. We will have to evolve such a system. We find blind faith in 20% individuals in the society. Approximately 5% people earn money in the name of Spirituality. About 30% of Ascetics are bogus. They earn money in the garb of Ascetics. 50% Ascetics have no knowledge of Dharma. Many revolutionaries and social reformers were of the opinion that the philosophy of Spirituality is a deterrent to progress from the perspective of social life. Even today, there are many who consider themselves progressive, but have the same opinion. Nevertheless, it will be entirely wrong to say that the philosophy of Spirituality is fundamentally opposed to the society, because it is spiritually evolved individuals who have set ideals in the world from time to time, and have appealed to the society to go towards these ideals. Since the new generation does not have Dharmashikshan, it feels that Hindu Dharma is old-fashioned. It feels that other religions, their behaviour and foreign languages are superior. Hence, the new generation of Hindus has fallen prey to the immorality that is a consequence of the blind aping of the westerners. Homosexuality, being so-called progressive, Communism, Socialism, cruelty, hooliganism, atrocious attitudes etc. are defects in the present society, which are a culmination of attraction to and blindly aping of the western culture. 1. Hindus do not learn the correct way of celebrating religious and Holy festivals. As a result, the bhav (Spiritual emotion) with which the festivals are celebrated is on the decline. They are being viewed as occasions for gratification. Malpractices such as extortion of money, obscene dancing, consuming liquor, smoking, eve-teasing are a common sight during the celebration of festivals. 2. Hindus do not know how to maintain the sanctity of their Deities. They use pictures of Deities to prevent spitting on staircases. Deities are also used in advertisements for commercial benefits. Hindu Dharma, Deities and Holy men are ridiculed through plays, films and newspapers. Being known as a ‘Hindu’ is like an abuse. 3. The Hindu society is falling prey to conversions, conspiracies like ‘Love Jihad’ of other sects. 4. Hindus have forgotten the importance of the cows. Hence, it is mostly Hindus who sell cows to butchers. 5. Hindus themselves are responsible for keeping temples dirty, since they are unable to appreciate their spiritual importance. Those playing film songs, gambling and consuming liquor in the temple premises are also Hindus. 6. Hindus are unable to comprehend that they will suffer spiritually due to laws made by politicians, policies they have adopted etc. Muslims are not affected by all these religious problems. Rather, till date, no such situation has ever arisen in their community. The reason for this is the Dharmashikshan imparted to them since their childhood. Hence, they are very alert about the norms of their sect. Contrary to this, Hindus do not receive any Dharmashikshan. Hence, there is no possibility of them being alert about the norms of their Dharma. There are various ways in which we protect Dharma. Of these, most are physical and psychological level activities; for example, stopping Christian priests who try to convert Hindus or stopping trafficking of cows being taken for slaughter. They are fine as temporary measures; but these are not long term measures. For how long can we drive away the priests and stop cows from being taken for slaughter ? If priests are driven away from one locality, they will go to another and preach; if trafficking of cows on one route is stopped, they will find another route. 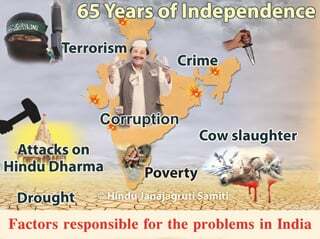 The one and only long term solution to all these problems is to impart comprehensive Dharmashikshan to Hindus everywhere. If Hindus understand the importance of Hindu Dharma, then no matter how many Christian priests approach them with any type of lure, they will not fall prey to the conspiracy of conversions. Hindu farmers will not sell their cattle to butchers and Hindu women will not become victims of ‘Love Jihad’. If the new generation is explained in a scientific language how every concept in Hindu Dharma is supreme, then it will certainly abide by Dharma. Thereby, the youth will be released from the cruel cycle of blindly aping the westerners and its harmful effects. Abiding by Dharma will awaken pride for Hindu Dharma among Hindus. 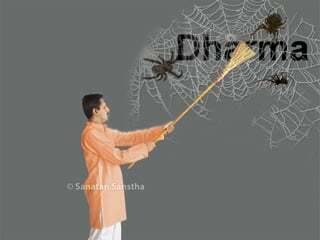 A society with awakened pride for Dharma also protects Dharma, or rather does not allow any harm to befall Dharma. A Nation that abides by Dharma has no fear of natural calamities, foreign invasions etc. Such a Nation is happy, virtuous and prosperous. When the entire human race will begin to abide by Dharma, the entire earth will become one Nation as it was in Satyayug. At such times, there is non-duality between the Nation and Dharma. 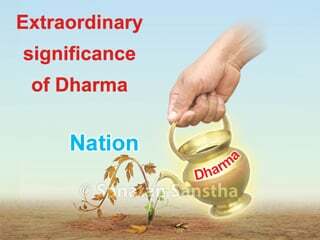 Nation is the Dharma and Dharma is the Nation. Only such a Nation becomes eternal. By now, you would have realised the importance of imparting Dharmashikshan to the society. Taking the Hindu society and the present social situation into consideration, we will have to make efforts in various ways to impart Dharmashikshan. Some of them are as follows. Discourses can be arranged for various groups on different topics, ranging from importance of Hindu Dharma, importance of performing sadhana every day, to how to celebrate a particular festival and its importance. Wherever the number of inquisitive Hindus is large, a weekly Dharmasatsang can be conducted. Sanskars of Dharma need to be made on children as well as the elders. For children, Balsanskarvargs should be commenced. Through these Balsanskarvargs, they should receive guidance on what prayers to recite at dusk, how their conduct should be with elders, what efforts they should make to inculcate virtues etc. If your organisation publishes a periodical, a column on Dharmashikshan can be started. Articles on topics such as importance of festivals and how to celebrate them, how should our conduct be according to Hindu Dharma etc. can be published. If your organisation has a website, such a column can be started on it as well. In the present era, audio-visual aids are the fastest mediums to spread information. Through them, we can effectively reach out to many people in a short time. Through this medium, we can impart Dharmashikshan to Hindus as well. CD’s imparting Dharmashikshan can be telecast through the internet or local cable networks. If this is not possible, then a group of 20-25 people can be invited to view a CD. Hindu Janajagruti Samiti (HJS) has produced a series of such CD’s which can be used for imparting Dharmashikshan to the people. If you need any assistance in conducting such campaigns, HJS will readily oblige. Since their establishment, Hindu Janajagruti Samiti and Sanatan Sanstha have been coducting campaigns to impart Dharmashikshan to Hindus. Hence, many Hindus have joined the mission of both these organisations. Dharmashikshan has played a major role in rapid growth in the mission undertaken by both these organisations. Whenever both these organisations faced problems, their volunteers and seekers remained firm. The main reason for this too is the teaching they received through the Dharmashikshan classes. We are now restricting our plan to the people in Bharat. Later, however, we have to think of the entire world. Our ancestors had proclaimed ‘कृण्वन्तो विश्वमार्यम् ।’, meaning, ‘let us make the whole world Arya (cultured)’ and had also implemented this. Till the Dwaparyug, earth had only one Sanatan Dharma, because of which human beings on earth were happy. Now, to make the humans happy all over the world, we need to establish Hindu Rashtra. This can be achieved through programmes on Dharmashikshan. The noteworthy point here is that other religions want to propagate their religion only to be able to rule the world, but the Hindus propagate their Dharma to make the entire human race happy. You too should make efforts in this direction. Perform sadhana yourself to increase your energy of the soul. My sincere request to you is – explain the importance of abiding by Dharma to your volunteers and help them do it. Impart Dharmashikshan to the Hindu society and make it deserving of a Dharma-abiding and ideal Hindu Rashtra. I pray unto the Holy feet of my Guru that may all of you be able to make efforts in this direction and may the obstacles encountered be overcome. Spiritual practice for the spread of Spirituality. Second month in the Hindu lunar almanac. Sacred text of the Hindus, which explains different paths to salvation. Narrated by Shrīkrushṇa to Arjun on the battlefield of Mahābhārat. Individual spiritual practice that benefits only the seeker undertaking it. A Sage who was a great Sanskrut poet and author of Rāmāyaṇ. 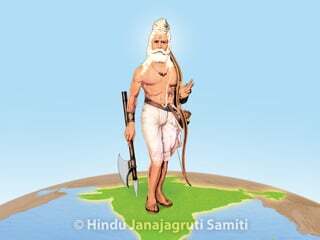 A great Hindu Holy epic written by Sage Valmiki, that depicts the history and life of Shrīrām. A respectful greeting that is accompanied by a gesture of joining the palms with the fingertips pointing upwards and held close to the chest. The third Era in the cycle of four Eras since the origin of the universe.